Well, there goes another season, yes the leaves have shed and the waves of golden colour have disappeared all too quickly. This morning, winter is well and truly asserting itself. As is often the case however that idyllic setting of crisp white snow covering a garden bejewelled with winter berries and colourful foliage (which is totally achievable by the way, we did a blog on it) is more likely to be a washout this year. With weather experts predicting the wettest winter for years, it becomes all the more important to be prepared for the worst and in this case that means waterlogging. Now this does not necessarily mean flooding so if you don’t live on a flood plain don’t become complacent, waterlogging is just as much a possibility, especially with the quantities of rain suggested, It can creep up on you, so here are a couple tips to help combat it if and when the problem arises. As any gardener, doctor or midwife will tell you, prevention is the best cure. This is especially true with waterlogging because tackling it once it has become a problem is a nightmare, so making sure you have adequate drainage before the deluge arrives is key. Long term this means adding soak-aways, drains, designing the garden with runoff in mind a (rose garden right at the bottom of an incline – not a good idea). Short term though it is just as important to make sure all your drains are unblocked, one of the main causes of waterlogging and even flooding is that the garden had proper drainage but over the year it has become clogged with leaves, silt and mud and so the water has nowhere to go. Give these a good clean out and pour a bucket of water down to check it’s clear then you should be ok.
Of course there are always cases where all the preparation in the world wasn’t enough and we end up with a very soggy garden. Hopefully it won’t be too bad, plants are clever little things and can often handle themselves in dodgy conditions, the problem is if the garden stays soggy. 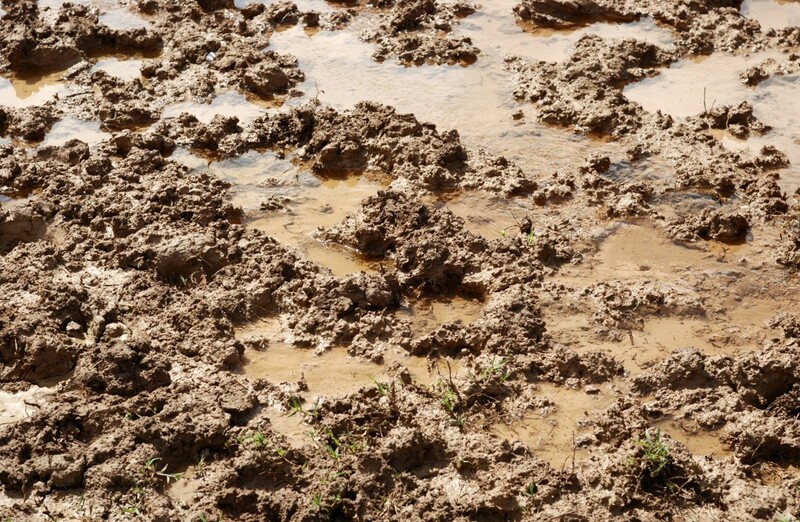 Waterlogging happens when the soil becomes saturated because water is going in faster than it can drain away and it isn’t always noticeable on the surface. (Ask the people of Boscastle). You can tell it’s becoming a serious problem by looking at the plants, specifically for yellowing and drooping of the leaves. In fact the symptoms you’re looking for are, somewhat ironically, those of dehydration. However in this case what you’re actually seeing is the early signs of root rot. The standing water has soaked the roots for so long that they are starting to rot away and as a result cannot absorb any water. If you see this then try and see if you can improve drainage, maybe there is a blocked drain you can unblock to get water away from the plants, or dig an emergency channel to a drain to try to get it to run off. If that doesn’t work it may be time for a bit of triage, dig up and repot any plants that haven’t been affected, then see if those that have can be saved. Dig them up and check their roots, if they are all black and slimy, then there is nothing to be done, but if only part of them are black you can try cutting these bits away and try repotting separately, do not plant them with the survivors however as they may still have fungal infections in their roots that can spread through the new soil. Whatever you do though, don’t waste time trying to dig in more soil or compost to counteract the water, no matter how much soil you put in you will not beat the rain, drainage is the only way to get rid of water. It can seem a bit daunting but don’t worry, most gardens have adequate drainage, if you take the preparation seriously then you shouldn’t have a problem. Waterlogging only happens in the worst case scenario, but if you keep these points in mind throughout the winter you’ll be able to tackle it if it becomes a problem.